Come with us for a tour of the mediaeval Lord Leycester Hospital in Warwick, followed by a light lunch/afternoon tea in the atmospheric ‘Brethren’s Kitchen’. Please click on link below for official poster/invite! To book please advise menu choices and send payment to Denise Carson, Cobblers Corner, 20 Whitehill Road. Kidderminister. DY11 6JJ by Friday 12th April 2019 advising of any dietary requirement Please click on poster below for details and menu choices! Several members of the club got busy with their sewing machines to make a range of ‘pillow-case dresses’ for Health Help International (HHI). These are simple slightly flared summer dresses for girls in India and Africa, which can be be cut out and made from a single cotton pillow-case. When HHI representatives came to speak to us, we were able to present them with almost 40 dresses in a range of sizes, colours, and fabrics. Many had unique features such as pockets, buttons, and bows, and we look forward to seeing pictures of the girls wearing them when they have been taken to India. President Sue and members of SI Coventry would like to invite you to our 90th Anniversary Dinner on Saturday, 30 March 2019, at the Brandon Hall Hotel, Brandon, CV8 3FW, at 7pm for 7.30pm. Our speaker will be Barbara Dixon, Vice President of Soroptimist International of Great Britain and Ireland. Tickets cost £32 per person, and the menu options are shown below. We would be grateful if you would let us know your menu choices on the attached form by Sunday, 10 March, so that we can inform the venue in a timely fashion. We hope very much that you will be able to join us for this celebration. SI Worcester and District ‘Call My Bluff’ Wine tasting! SI Central Birmingham 90th Charter Lunch! We are pleased to invite you to our International Night on 11th December 2018. We shall meet at the Warwick Masonic Rooms 23. High Street, Warwick CV34 4AX. There is parking at the rear of the building accessible from Back Lane which runs between High Street and Castle Lane. .
As some of you will already know this is our last International Night as the club is due to close in the New Year. It is a poignant time but also an opportunity for club members past and present together with other Soroptimists, club friends and partners to celebrate our 82 year history. The evening will commence at 6.45pm with a performance by “Melody Makers”. Our Traditional Candle Lighting Ceremony will follow when we remember Soroptimists all over the world. After dinner there will be time to reminisce. There will be a raffle in aid of International President Mariet’s appeal entitled “ Women, Water and Leadership 2017-9.This will be drawn after dinner. If you would like to join us please email or post June James your menu choices (see attached reply ) and send a cheque for £22 made payable to S.I. Leamington and Warwick by 24th November. Please open link below to see official invite! Solihull and District Club have been marking the centenary of some women getting the vote a hundred years ago. On Friday 16th November, at Solihull College, our final event will be held which is a conference looking at democracy today. See below the link to Solihull’s exciting fashion Show in November in aid of Anawin which supports vulnerable women and children. Below is the link with details of SI Rugby’s Coffee morning in aid of the Purple Teardrop Campaign. All welcome! SI Kenilworth President Anita, Georgie, Tricia and Elaine received a very warm welcome from their Dutch Friendship Link club, SI Arnhem Oost, and their joint German Friendship Link club, SI Remscheid. The theme of the conference was ‘Empowerment’ and they attended interesting workshops, including one on mentoring. 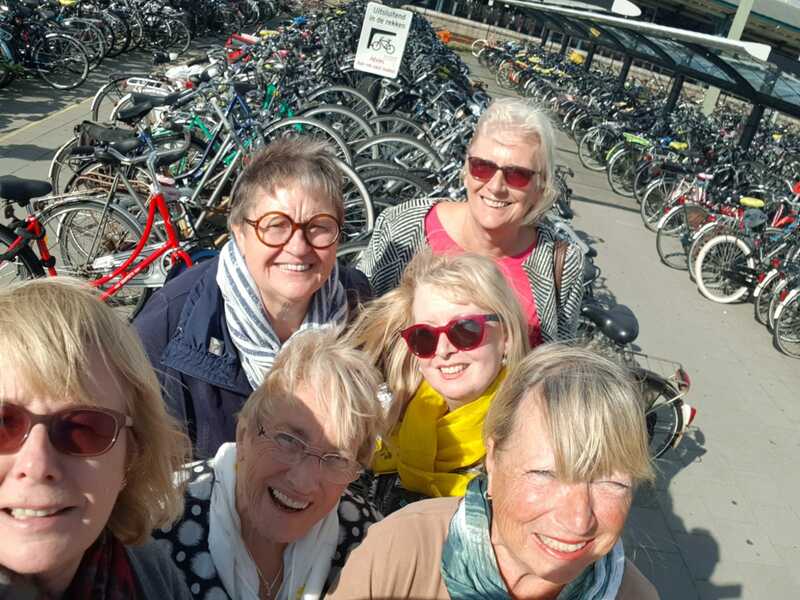 Over 500 Soroptimists from 15 countries joined the weekend festivities and a full programme of events commenced with a welcome drinks party in the former Royal Palace. This was followed the next day by a conference with interesting speakers (in English! ), afternoon workshops, a fashion show featuring local designers, a cabaret and finished with a walking tour of Leeuwarden. A canal trip on Sunday gave them the opportunity to experience Leeuwarden from the water. Leeuwarden is this year’s European Capital of Culture and has a beautiful mixture of old and new architecture. The atmosphere was relaxed, the weather was good, and they were made to feel so welcome by fellow Soroptimists, and by the residents in the town itself. Members of SI Rugby hosted a fashion show with Wanda Fashions of Dunchurch to raise money for the Hill Street Summer Scheme for disadvantaged youngsters. Members of the club modeled the clothes, there was a glass of Prosecco and also a raffle. Over 120 people attended and hopefully a lot of money will be raised. International Womens Day Sing for your supper! We’d be delighted if you could join us to celebrate International Women’s Day this year. We’ll be ‘Singing For Our Supper’ led by Rebecca and Bruce Knight of Natural Voices. Come and learn simple harmony songs from around the world. This event is open to everyone, whether you are an “only in the shower” singer, or an experienced crooner. An African proverb goes “If you can walk you can dance, and if you can talk you can sing”, and Bruce and Rebecca will prove this is indeed the case. Simple songs – quick and easy to learn and satisfying to sing, inspired by International Women’s Day. Be prepared to move your body and sing your heart out! NO NEED TO BE ABLE TO READ MUSIC – all songs will be taught by ear. Bruce has been running singing workshops since 2000, and is known for his easy-going style and infectious enthusiasm. He is the leader of the 100-strong Songlines Community Choir. Rebecca runs the Morning Chorus women’s singing group, has taught at previous IWD events, and together Rebecca and Bruce have run singing workshops at camps and festivals in the UK and beyond. Please click on links below to see details of SI Solihull’s Fun In the Park event which is at Tudor Grange Park from 11am-5pm. In aid of local charities – hope to see you there! Please click on link below for details of SI Kenilworths Charity Quiz this year – raffle on the night with great prizes! On 22nd April, members from most clubs in Midland Arden Region attended free workshops to learn new skills in social media, press relations, and ideas for club newsletters. The aim was for those clubs who currently don’t have Facebook or Twitter sites, to set them up and start using them to promote the fantastic work they do; build relationships with local TV and press ensuring we attract their attention; and making club newsletters a good communication tool for members; potential members; and maybe even partners. All of these are excellent ways of promoting the work of clubs within the Midland Arden Region. Celebrating Achievements for the Year, Plans for the Future! Posted on Monday, March 27th, 2017 at 3:26 pm. Each workshop will last for one hour and each member can attend two workshops. Tea/Coffee will be available at registration. Please let Ann Keepax know by 8th April if interested in attending.